I'm joining Cindy of My Corner of Katy, with a Three For Thursday post. Cindy says it best~"Pick 3 pictures of plants from your garden ... tell us about 3 books you've read that you want to share ... rant about 3 things that bug the heck out of you ... show us 3 pieces of garden art or 3 photos of egregious crimes against gardening ... have fun, be creative and leave me a comment when your post is up!" 1. 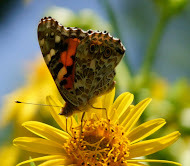 Always take your camera with you into the garden, on errands and especially on visits to other gardens. Even when you're just running out to get the mail. That's when the butterfly you've chased around the garden all day is posing sunning on the cup plant or the light is "just so perfect" you want to cry from the beauty. I can't tell you how many good opportunities I've lost because I left my camera on the dining room table. He's fast asleep and hugging tight, the next morning bright and early he'll be gone (more here about sleeping bumbles) If you're feeling brave, you can gently pet the sleeping beauty. Trust me, once you get into the habit of taking your camera into the garden every time you head out, you'll capture some of your best shots and you'll almost never forget where you set it down. 2. Don't be afraid to break photography rules. Shoot into the sun~you will find some of your best shots come from the glare off your lens, the back lit grasses or the silhouetted flowers. 3. Don't chase perfection~Hoses, bags of mulch or any evidence that your garden is a working garden is a fact of life. Don't apologize...Sometimes the best shot, the one that conveys what you want to share includes a telephone pole, garden tools or isn't completely in focus. Unless you're entering a photo contest~none of your readers really cares about your garden tools or that a bird isn't in focus. They're just as excited as you are to see a pileated woodpecker. Great tips, Gail. 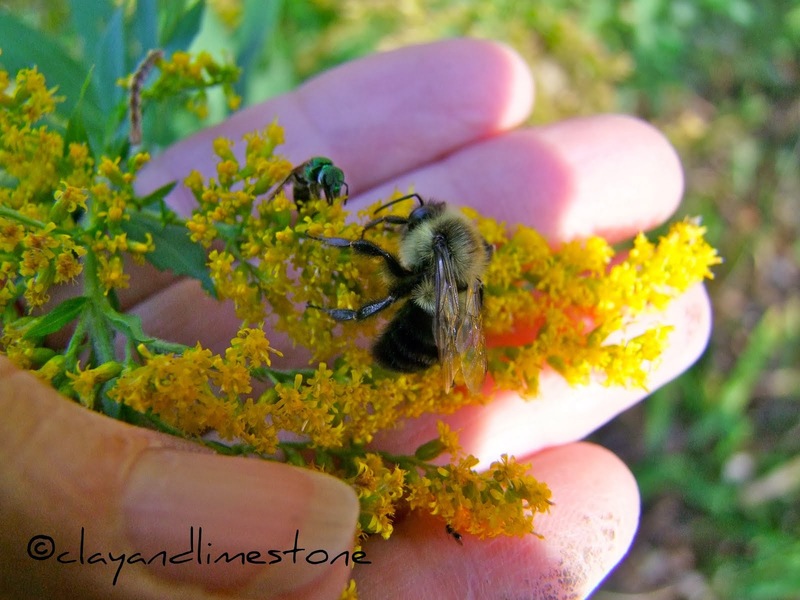 I might add, though, that if you go out to weed the garden with camera in hand, the bees and butterflies might just distract you from your chores:) Marvelous photos of the bumbles, as always! Gail, thanks for posting on Three for Thursday and for some great suggestions. I tend to be timid about taking my camera outside, worried that I'll take it off to do something, set it down and then forget it's there. I love shooting into the sun ... it can produce some unusually beautiful views of the garden. One of my rules for myself re taking pictures of the garden as a whole is that I leave things as they are at that moment. I might move one thing if it's in my way but I don't tidy up the whole garden. Great post Gail and the pictures you chose are fantastic! I would certainly love to see a pileated woodpecker!I love seeing it vicariously too. Good advice even for the not-so-new blogger. Some of the best photography advice I've ever read. Now, I'm off to plant some things which have died. Lator Gator. Maybe my Three for Thursday will be about what no longer resides here. Nice shot of the woodpecker! I saw one of these in the spring in the backyard. It made a couple pretty good dents in a tree. Good advice too. I wish I could carry the camera everywhere but the DSLR is too bulky to wear while doing any major garden chores. Great tips. Love #3 especially. In years past, I fretted over pics. Now I just post them, untouched, in all their messy glory. Keeps it real. Have a wonderful Labor Day weekend. When I started blogging I took pictures with our family camera - Canon SLR. I was taking so many pictures that my husband began to complain about the camera never being available to him. So I bought myself a Canon Powershot - not so sophisticated but it works just fine and has lots of features I haven't had a chance to try yet. For manual focus macro shots I still prefer the SLR. But now I can always have my camera in hand! Good advice. I'm getting better at making sure I have my camera handy. You best photo was the best. I'd love to have a pileated woodpecker visit. Great advice Gail. I agree, absolutely shoot into the sun, early or late in the day, and use that flash, even in full sun, to banish annoying shadows. It's funny, I do usually remember to take my camera into the garden...but sometimes I forget to take my trowel, or my trusty pruners! Great photography advice, Gail. I love your shoot-into-the-sun shots. I loved this advice. My first visit to your blog, I'll be back! Great advice Gail, thanks. As a newie to blogging I do stress about photos not being right and lost opportunities because the camera is inside when I see something special. I'll take your advice. That is great advice! My camera has it's own little garden stool. I do enjoy you photo style and know folks will learn from your advice. great advice and reminders to us all. 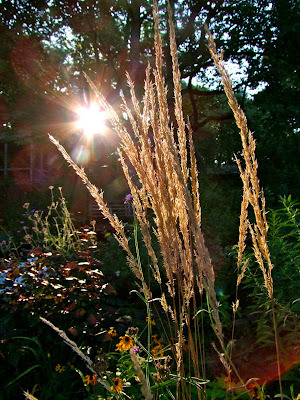 i LOVE the shot of the backlit grasses. i totally agree...have fun and take dozens of photos of any and everything. Even I have trouble with #1. Okay, I have trouble with #3 also. Thanks for the pertinent advice. I love your photos, you capture the coolest wildlife shots. Excellent advice on all three points. Three stars to you! How did you get that close to a Pileated woodpecker? Wow! I'm impressed! And, boy are you correct on the advice....always have your camera ready. I can't tell you the missed shots I've mulled over. Good advice. I have started to make a point to carry the camera at all times. You never know when opportunity knocks. The timing and great light really makes Woody a huge hit! You come up with such great ideas for day of the week events to blog about. These 3 tips are perfect for blog rookies like me. I do think that you just happen to be a good photography - don't know if I could have caught these great pics but you've encourage me to try! When are we going to Missouri Botanic Gardens?! Wonderful tips for new bloggers. Do you have any advice for "old" bloggers who have already written about everything in their garden? I feel like I'm at the end of my blog after over 3 1/2 years of blogging! I take mine with me as much as possible. One evening I didn't and that was the evening that the hummingbird hawk moth was in the garden and I still have never managed a shot of this wonderful creature this summer. Oh if only............. but there's always next year! Wonderful advice, Gail! My friends laugh at me because I ALWAYS have my camera, but like you said, you don't miss out on the best shots that way. And your Pileated Woodpecker is stunning! What great advice. The other day the light was beyond beautiful in the evening, but I was too tired to drag myself out to photograph. Now I'm sorry, as that kind of light doesn't show up all that often. Gail I can hear Woody's BONK BONK BONK all the way up here. What a great shot & terrific advice. We're between showers - a blessing and am going to see if i can catch my first butterfly with my new toy. Fingers crossed! BTW if you want to play Our Friend Ben's game StatCounter will tell you what keywords your visitors used. Great shot of the woodpecker! This is great advice! It is so true - many times I have missed a perfect photo, because my camera wasn't with me! Great tips! I would add one more: Don't lose your camera's manual! Gail, you are so wise and wonderful! I especially like the advice not to go for perfection. I've a short attention span, and if I thought every post had to be a masterpiece, I'd never blog. I love the immediacy and joy of just capturing and sharing whatever is exciting in the garden, and there is always something! Great advice and beautiful captures. I can never remember the one about take your camera with you... always. I can't figure how to do that and actually garden. :-) Just this morning very, very early watering a few containers... so many little birdies flitting around me without fear. No camera. I just decided to breathe it in and be grateful for the moments. alas. A timely reminder Gail, I have got very lax about taking my camera out and about with me this year. I love the fact that Sandy's camera has its own stool in the garden!! Each tip and photo was great! I love your tip about taking a picture into the sun for back-lighting, I am going to try that! I totally agree on not chasing perfection. Perfectionistic tendencies can prevent you from even getting started in your garden! thanks to Jen for sending me back to enjoy an old post.